A01- Pilgrimage R.E Kieron Curran There are many places of pilgrimage but there are only a few main ones, which includes Lourdes. The story of how Lourdes came about is when a young girl called Bernadette went to the grotto and saw a woman in the grotto and told her to come back for fifteen more days and she told her to do several tasks like wash and dig in the mud until she reached a spring and water started to flow and go and tell the priest to build a chapel but nobody listened to her until she asked the lady in the grotto her name her name was Mary. "I am the immaculate conception" and she went to tell the priest what Mary said and he knew she was telling the truth and from the on people went to the grotto to pray. ...read more. They process in memory of Mary mother of Jesus as she asked us to remember her. This is also a time for people to have a reflective and quiet prayer. The Stations of the Cross are large life like statues, which are placed on a steep hill, which is nearly a mile long. Pilgrims also light candles outside the grotto to remember family and friends who have asked to pray for them. So people get larger candles so the prayer remains when they have left. Blessed sacrament procession pilgrim's process behind the Blessed Sacrament as an act of prayer reflection and remembrance of Jesus. Jerusalem is a major catholic pilgrimage area this is because this is where Jesus was born lived and died. Catholics go on pilgrimage to Jerusalem to remember Jesus' death. ...read more. at noon darkness covered the land it lasted three hours. At 3o'clock Jesus cried out in a loud voice "eloi, eloi lama sabachthani. This means my god my god why have you deserted me. The people nearby said listen he is calling for Elijah. A man offered Jesus something to drink he said let me see if Elijah comes to take him down. With a loud cry Jesus took his last breath. Another reason for visiting Jerusalem is for the holy place of sepuchre this is built over the place where Jesus was crucified and where his body and tomb was laid. The effects Jerusalem has in pilgrims is that they might feel sorrow and sad because it is where Jesus died. For example the via Delorosa the path that Jesus took and when he was struggling and going through distraught time in his last years of his life. Pilgrims might fill sad knowing how Jesus struggled with his heavy cross and the thorns on his head. ...read more. 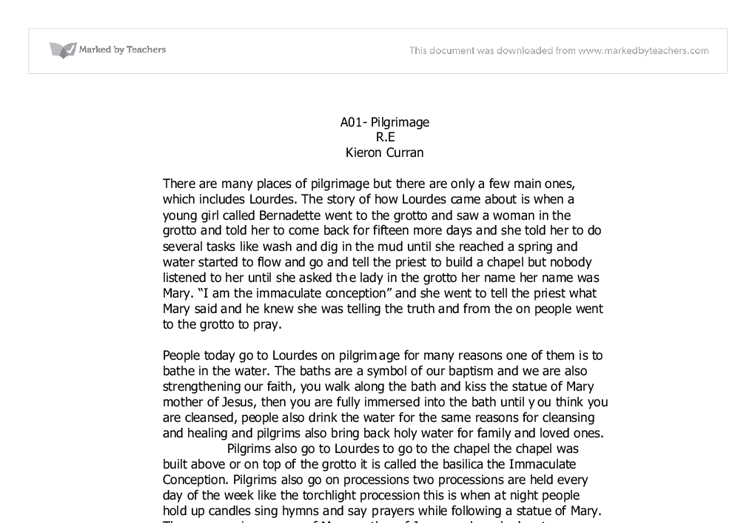 This student written piece of work is one of many that can be found in our GCSE Pilgrimage section. Pilgrims that went because of this were already firm Christian believers, but going on a pilgrimage would usually make them even stronger. Going by their own free will they are more likely to come away more religious than if they were forced to go or went because of pressure from their social life. Many pilgrims visit the spring described to Bernadette. Some bathe in the water and hope that it miraculous powers may heal them. Lots drink the water for similar reasons and many take the water home to give to friends and family etc. 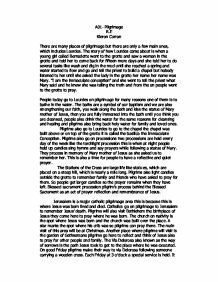 In this coursework I am going to talk about a Christian place of pilgrimage. The Blessed Sacrament is the wafer of unleavened bread consecrated in the Mass and is the Body of Christ. It is placed in a monstrance and held aloft by the Bishop so that everyone can see it. Another procession followed in Lourdes is the Torchlight procession that occurs every night around the grotto. There is also a statue of Our Lady in the grotto where pilgrims may remember Our Lady with her eyes raised toward heaven. During the pilgrimage there are special masses, candlelight processions in the dark and many youth activities. Many young people visit Lourdes, to help the sick who are often searching for a cure.